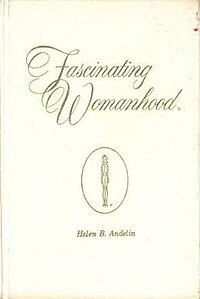 Fascinating Womanhood is a book written by Helen Andelin and published in 1963. The book recently went into its sixth edition, published by Random House. The book has sold over 2,000,000 copies and is credited with starting a grassroots movement among women. Derived from a set of booklets published in the 1920s and 1930s by the Psychological Press, the book seeks to help traditionally-minded women to make their marriages "a lifelong love affair". According to Time magazine, Andelin wrote Fascinating Womanhood when "she felt her own marriage wasn't the romantic love affair she had dreamed of." The book's self-published edition sold over 400,000 copies, and since being published by Random House, the book has sold more than 2 million copies. including foreign markets. It has been translated into seven languages. The book serves as a touchstone for those of the anti-feminist persuasion. The book takes many of its sources from historical women and from examples provided in classic literature. One of the "real life" women, Mumtaz Mahal of Taj Mahal fame, is cited as one of the ideal women who possessed both an angelic and a human side. More sources come from classic literature: Amelia (the original domestic goddess) of William Makepeace Thackeray's Vanity Fair, Agnes and Dora from David Copperfield by Charles Dickens, and Deruchette from Victor Hugo's Toilers of the Sea. Although the book was published in the early 1960s when second wave feminism became part of the American mainstream, Fascinating Womanhood's traditional explication of happy marriage resonated in the minds and hearts of millions of women. By 1975, according to Time magazine, the movement included 11,000 teachers, and over 300,000 women had taken the series of Fascinating Womanhood classes. Unlike other antifeminism movements of the 1960s and 1970s, the Fascinating Womanhood movement continues today. The now-deceased Andelin maintained a website that received over a quarter of a million visits. The classes continue in Namibia, The Philippines, Japan, and Malaysia, and in the United States in Alabama, Arizona, California, Florida, Utah, and Virginia. Fascinating Womanhood has gained the attention of feminist writers, who largely regard the book as detrimental to women in various ways. In 1978, psychologist Martha L. Rogers wrote an article ("Fascinating Womanhood as a Regression in the Emotional Maturation of Women") positing the argument that women who follow the book's teachings were doing so out of a fear of being self-actualized individuals. Juanne N. Clarke of Wilfrid Laurier University wrote that the movement used Kanter's Model of Commitment Mechanisms to analyze the techniques used to gain women's allegiance. More recently, Pink Think: Becoming a Woman in Many Uneasy Lessons, by Lynn Peril, cited Fascinating Womanhood as part of a body of literature that seeks to promote "an idealized version of womanhood". Finally, communications writer Julia Woods discusses the Fascinating Womanhood movement in Gendered Lives: Communication, Gender, and Culture. ^ "Pacific Press Santa Barbara Pierce City company profile, news, and business information | HighBeam Business: Arrive Prepared". Goliath.ecnext.com. Retrieved 2012-12-07. ^ "Helen Andelin Author Bookshelf - Random House - Books - Audiobooks - Ebooks". Random House. Retrieved 2012-12-07. ^ a b "Fascinating Womanhood by Helen Andelin - Book". Random House. Retrieved 2012-12-07. ^ a b "The Sexes: Total Fascination". TIME. 1975-03-10. Retrieved 2012-12-07. ^ "The Sexes: Total Fascination". TIME. 1975-03-10. Retrieved 2012-12-07. ^ a b "Marriage, the Fascinating Way, By Helen Andelin". Fascinatingwomanhood.net. Retrieved 2012-12-07. ^ "Fascinating Womanhood as a Regression in the Emotional Maturation of Women". Eric.ed.gov. Retrieved 2012-12-07. ^ "Becoming fascinating - Springer". Alternative Lifestyles. 4: 75–89. 1981-02-01. doi:10.1007/BF01082089. Retrieved 2012-12-07. ^ fascinating womanhood pink in many uneasy lessons - My library - Google Books. Books.google.com. Retrieved 2012-12-07. ^ Gendered Lives: Communication, Gender, and Culture (with InfoTrac) - Julia T. Wood - Google Boeken. Books.google.com. Retrieved 2012-12-07. Julie Debra Neuffer (October 28, 2014). Helen Andelin and the Fascinating Womanhood Movement. University of Utah Press. ISBN 978-1607813279. This page was last edited on 4 February 2019, at 21:43 (UTC).